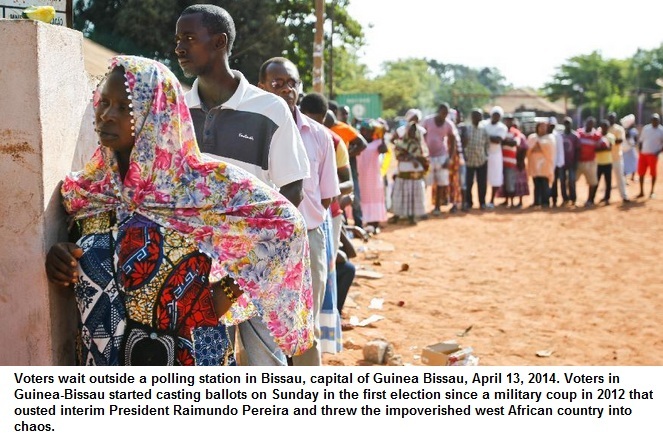 BISSAU- The first presidential and legislative elections since a 2012 military coup in Guinea-Bissau was held on Sunday amid hopes for a return to stability, as nearly 800,000 voters cast ballots at polling stations across the west African country. Voters will elect a president from 13 candidates and 102 lawmakers from candidates fielded by 15 political parties vying for parliament. More than 500 international observers are monitoring the voting process to ensure it is free and credible. It was the first election in the impoverished country after a military coup in April 2012 ousted interim President Raimundo Pereira and threw the country into chaos. Former finance minister Jose Mario Vaz, candidate of the African Party for the Independence of Guinea and Cape Verde (PAIGC) , Abel Iamedi Incada of the Party of the Social Renovation and independent Paulo Gomes, a renowned economist who has long lived and worked abroad, were among the favorites for the presidency. If no candidate wins an outright majority, a second round run- off, which analysts say is likely, will be held in May between the top two candidates. In Bissau, capital of the country, voters formed long lines at polling stations set up in schools before the polls opened at 0700 GMT. At a school in Bissau, presidential hopeful Jose Mario Vaz posed in the shade of a mango tree before casting his vote as a group of photo journalists scrambled to take shots. The national electoral commission said the vote began without any delay and in calmness, with a strong turnout of the voters, most of whom were voting for the first time. The polls are due to close at 1700 GMT. The United Nations, which has been helping Guinea-Bissau to restore stability, hopes that the election, which has been postponed several times, will go a long way towards building constitutional order, economic growth and development. The world organization is also calling on the political parties, their supporters and other stakeholders in Guinea-Bissau to respect the result of the election. On the eve of the polls, UN Secretary-General Ban Ki-moon called on the people and institutions of Guinea-Bissau to ensure the conduct of peaceful and credible elections, adding that the candidates and their supporters, the transitional government, election management bodies, civil society and the population at large all have an important role to play in this regard. Guinea-Bissau, a former Portuguese colony which gained independence after a war ended in 1970s, is one of the poorest and most unstable countries in Africa. More than two-thirds of the population lives below the poverty line, according to a World Bank report issued in May 2013. No elected president has completed a five-year term and the last election attempt two years ago failed after a military coup upended the country days before a scheduled presidential run-off.